The Dewoitine com-pany was nationalized in 1936, becoming part of the SNCAM (Societe Nationale de Constructions Aeronautiques du Midi), and on the outbreak of the Second World War the D 520, designed by Robert Castello, was the French air forces's most advanced fighter. Designed a new fighter to meet the French Air Ministry Programme A23, which in its revised form called for a maximum speed of 520km/h, was the was inspiration to give it the designation D.520. Three prototypes were ordered by the French government in April 1938, the first (D 520-01), powered by an 664-kW (890-hp) Hispano-Suiza 12Y-21 engine, flying on October 2 of that year with Marcel Doret at the controls. With this powerplant the aircraft did not achieve its required speed of 520 km/h (323 mph), but with an uprated 12Y-29 engine with jet exhaust manifold, the design speed was reached. Even before the first flight of the third prototype in May 1939 the company had received orders for 200 of the new and potentially decisive fighter, the figure rising to 710 within two months. 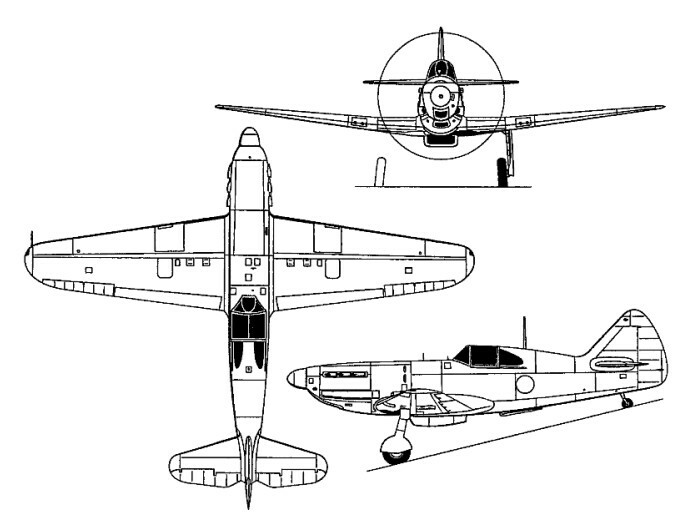 The second prototype (D 520-02) with a redesigned tail, wing radiators replaced with a ventral unit, introduced a sliding cockpit hood, and other aerodynamic improvements flew for the first time on January 28, 1939. It was fitted with a provi-sional armament of one HS 404 20-mm (0.79-in) Hispano cannon firing through the propel-ler hub and two 7.5-mm (0. 295-in) MAC 1934-M39 machine-guns in underwing fairings. It was powered by a 12Y-29 (later 12Y-31) and reached a speed of 550 km/h (342 mph). The D 520-03 third prototype was similar to the second, and first flew on March 15, 1939. It had a steerable tail-wheel instead of the tail-skid of the other two aircraft. Powered by a supercharged 678kW Hispano-Suiza 12Y45 engine, the D.520 was armed with an engine-mounted HS-404 20mm cannon and four wing-mounted 7.5mm MAC machine-guns. The wing was a single-spar structure with duralumin skinning. Ailerons were fabric-covered and flaps pneumatically operated. The fuselage was an all-metal monocoque structure and the wide-track undercarriage legs retracted inwards into the wing profile. Main production lines were at the SNCAM Toulouse factories. For the first time in France women joined the workforce and sub-contractors previously outside the aircraft industry were employed. Each aircraft required only half the man-hours needed to build the main French fighter at that time, the MS 406. The first production example, from an initial order for 200 placed in April 1939, flew on November 2, 1939, powered by a 930-hp Hispano-Suiza 12Y-45 engine. Many modifications were required and by the time the German Blitzkrieg was launched only 50 D.520s were with front-line units. Orders up to April 1940 required 2200 for the Armee de l'Air and 120 for the Aeronavale, but many were cancelled due to difficulties in maintain-ing the production rate. Fewer than 300 had been delivered by the time of Germany’s invasion of France in May 1940, rising to 403 by the time of the Armistice. The fuselage of the production machines was lengthened by 51 cm (20 in), the engine cowling was modified, two additional fuel tanks were fitted within the wing leading-edges and armour protection was provided for the pilot. The armament was increased by a further two 7.5-mm (0.295-in) M39 guns enclosed in the wings. Deliveries began in January 1940, but when the German armed forces made their attack against France on May 10, 1940, only 36 D 520s, equipping GC 1/3, were in service. They flew their first operational sorties three days later and proved extremely effective under fire, establishing a 2/1 'kill ratio' over Luftwaffe opponents. As deliveries increased, D 520s served with five Groupes de Chasse during May and June, and by June 25, 1940, a total of 437 had been completed. By the time of the fall of France the D.520 had claimed 114 victories and 38 probables. After the armistice with France, Germany permitted her a limited air arm (Armistice air force), but there were no D 520 units in the occupied country. Over 300 aircraft, however, remained in unoccupied France and North Africa and were used by the Vichy French air force. The German authorities ordered a further 550 D 520s to replace all other single-engined fighters in French service, and, although they saw considerable action against many British aircraft, their losses were few. In November 1942 the Germans entered the hitherto 'Free' French areas and commandeered 246 D 520s plus a further 169 in various stages of production. The SNCA de Sud-Est received a con-tract from the Germans to complete 150 of these machines, and by the summer of 1944 they had been delivered, bringing total D 520 production to 905 machines. A few of these were used as by the Luftwaffe Jagdgeschwadern in the USSR, and D 520s also equipped JG 105 at Chartres, JG 103 in Austria and JG 101 in Pau Long. Sixty D 520s were allocated to the Regia Aeronautica as trainers and second-line fighters; 120 formed the basic strength of the Bulgarian air arm, and a few saw service with the Romanian air force. As the Germans retreated in the autumn of 1944, the liberated French recaptured about 75 D 520s. These helped reform the French air force on December 1, 1944, and they flew with the Forces Francaises de l'Interieur during the closing months of the war. In late 1945, one of the 17 Dewoitines still in use as trainers at Tours was converted to two-seat configuration and designated D 520 DC; 12 were thus modified. Some D 520s were phased out of service through lack of spares in mid-1948 and the last unit was disbanded in September 1953. This aircraft had been originally designed to accept a 1300-hp engine, in order to reach a speed of 595 km/h (370 mph), but no reliable engine of this power was ever available for trial or production aircraft. Variants were mooted and trialled with different engines. Engine: l x Hispano-Suiza 12Y-45, 687 kW / 935 hp. Span: 10.2m (33 ft 5.5 in). Length: 8.6m (28 ft 2.5 in). Max T/O weight: 2677 kg (5,902 lb). Max speed: 332 mph at 18,045 ft / 342 mph at 13,120 ft.
Armament: 1x20-mm Hispano-Suiza cannon and 4 x 7.5-mm / 0.295-in MAC machine-guns.